Download the Landscaping Invoice Template to charge clients for services such as routine lawn mowing, weed whacking, hedge care, power washing, or other home and yard related services. To save time and reduce potential errors, both the PDF and Excel versions automatically calculate several fields. Additionally, all four versions can be easily edited to add a custom field or insert a logo. Included below is a pricing guide for charging clients as well as a how-to for completing the landscaping invoice in PDF, Word, and Excel. Anticipate the amount of work – Take the time to travel to the location where the landscaping will be done. Visualize each step of the process, including the amount of soil, tools, and workers you will need and the time it will take to set everything up. Setup time and breaks are often overlooked – so to be safe, add-on one (1) to two (2) hours to the actual labor time to be safe. Check with your competitors – If you are new to the area in which you will be bidding for work, take the time to look online or in the paper to see the general rates charged for landscaping. After you have added up all your expenses, you may find that you can charge a lot less than your competitors, which will bring in more work and leave customers feeling satisfied. Add up the plant expenses – Regardless of whether you will be planting trees, shrubs, flowers, or other plants, you will want to price out the number and cost of each. If you are giving a quote, don’t expect the number to be 100% accurate. However, make sure to keep all receipts if adding up the cost after the job – as it will instill trust in the customer and ensure you are covering all expenses. Cost of soil – To calculate the cost of soil before doing the work to serve as a quote, first calculate the area of the land where work will be done (length X width). Then, multiply that number by either .166 (for 2 inches of depth) or .25 (for 3 inches of depth) depending on how deep you would like to make the soil layer. Then divide your answer by 27 to find the amount in yards. Find your local price for one (1) yard of mulch and multiply that by the number of yards of soil you will need. Add everything up – Add the number of hours you anticipate to work by a rate you deem is sufficient and then add on mulch and plant costs. If you find your margin is too small, consider charging a selling cost for the materials you purchased. For example, if you bought $500 worth of soil and plants, charge the client an additional 10% the cost of everything purchased. In this example, you would then charge the customer $550 (plus labor + other charges). Step 1 – To begin, download the Landscaping Invoice in either Adobe PDF or Microsoft Word. Step 2 – Enter the Company Name and the Contact Information for the business at the top of the page. Step 3 – For the Bill To section, complete all contact fields relating to the billed client. If a piece of information is not available, enter ‘N/A’ or leave the space blank. Step 4 – Enter the Landscaping Services completed for the client. Starting from the left, enter the number of times each service was done (Quantity), the Item Number (if applicable), a short Description of each service, the cost per service provided (Unit Price). The Amount column will calculate automatically, along with the Subtotal cell. Then, enter any additional Sales Tax in the designated field. The TOTAL field will then display. Step 5 – In the Comment Box, enter any information regarding the services done, or simply thank the customer for their business. Finally, specify the Number of Days the customer has to pay the invoice in full at the bottom of the page. The invoice is now complete and can either be sent digitally via email to the client or printed and mailed. 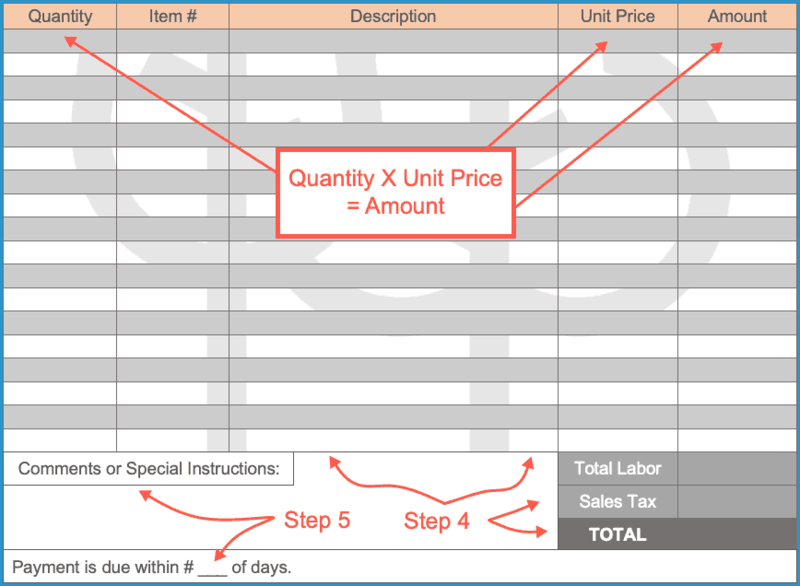 Step 1 – Download the invoice in Microsoft Excel. Step 4 – Enter the services rendered for the client. Enter the Quantity of each service provided, each service’s Item Number (if applicable), a brief Description of the services, and the Unit Price of each service. The Amount values will calculate on their own. Step 5 – At the bottom of the invoice, enter the Sales Tax percentage (as a decimal). The TOTAL invoice amount will then appear. Write any Comments regarding the landscaping job such as what types of plants or trees were planted, anything that went wrong, payment instructions, or a simple thank-you for choosing your services. Finally, enter the number of Days until the invoice will be due; the invoice is now complete.